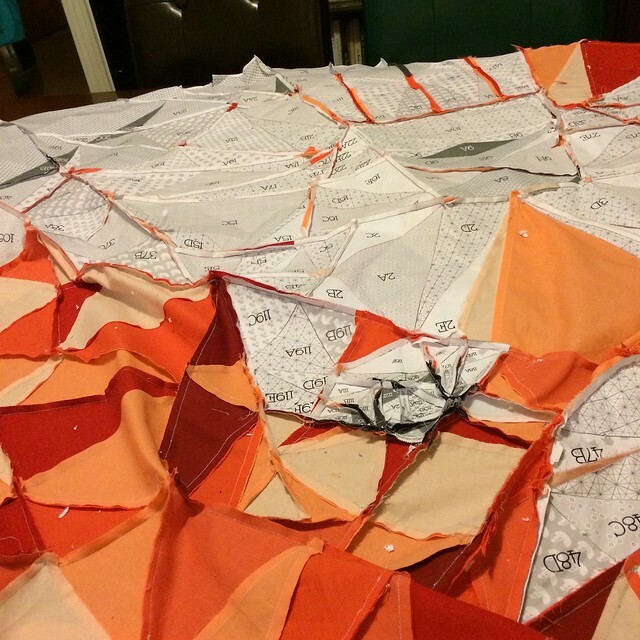 Today I have a quilting update - I know, real sewing instead of giveaways and such. I am thinking my quilting mojo is back now, thank you for being patient with me. 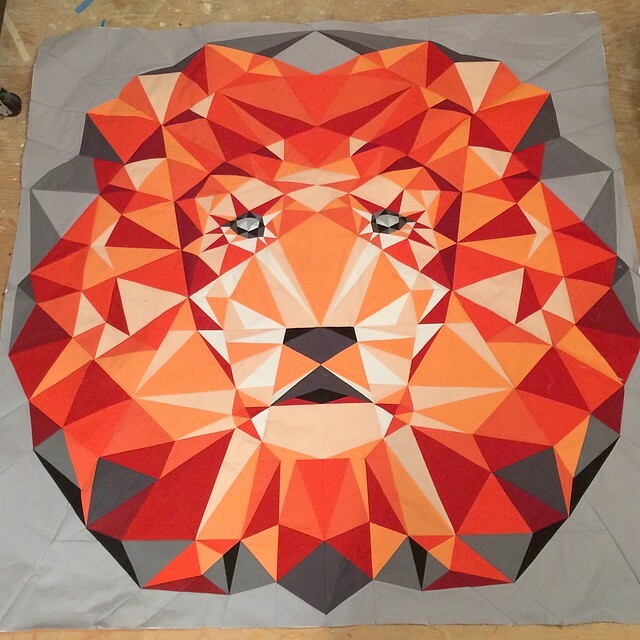 I wanted to start at the end of the update, there is the Lion, a #jungleabstraction quilt pattern by one of my favourite designers, Violet Craft. That photo was taken while almost all the paper was still in place on the back. 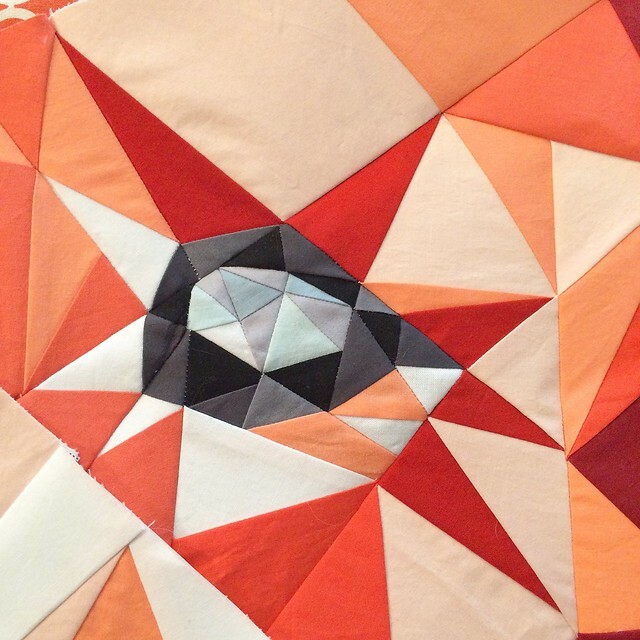 The astute among you will find the one piecing mistake I am aware of (there could easily be more), I was alerted to it by a lovely blog reader some time ago and decided to leave it in place - my hand in the quilt if you like. This quilt has been a great project. I initially wanted to finish it in a month, but now I am 8 months in so patience is one lesson. 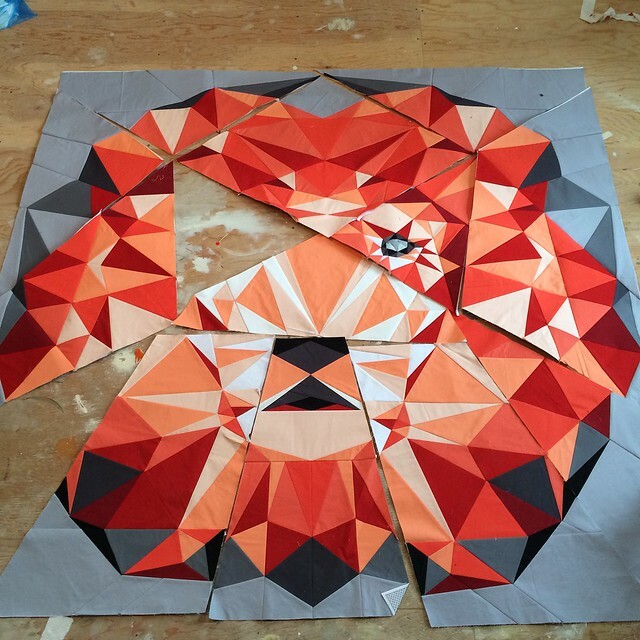 Initially I pieced the individual pieces and then connected the larger sections as I went. But then I started using this project for when I was tired and wanted to sew by number and draw on the lines so to speak. So I just make the individual pieces, all 120 or so of them and stacked them up. Next I put together the larger chunks, which took quite a while. Above is one of the eyes, this quilt is so dramatic and I am please to see that I managed to keep most of the points in view, but not all by a long shot. Piecing the larger chunks together was unexciting and I totally gave up on worrying about the points. I focused on getting the joins where they belonged. A lot of people on instagram offered me their experiences and ideas as I made this quilt - feel free to check out my instagram feed. 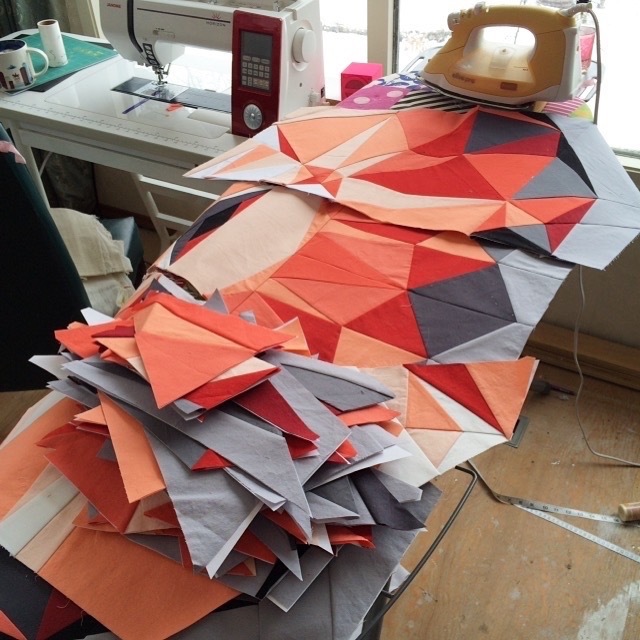 There are many ways to put together a paper pieced quilt and I opt to keep the paper in place as I go. There are a lot of bias edges on the pieces and the paper keeps them from stretching as I handle them - especially as this project has been handled so much over so much time. It also means that I have reference points to join together on the paper which helps me out. But once you sew the seam allowances into the folds, it is hard to get the paper out, so you will see in my photos that I take off those bits of paper that will be sewn in as I go. Eventually I was at the point of putting together 4 very large chunks. This was slow and awkward. And then, as I tossed it on the floor for that moment of admiration, I realized I had reversed the two pieces which include the eyes. The air turned quite blue and an x-rated moment or 10 in the quilting room occurred. There is no excuse for this mistake. Violet carefully numbered this quilt so that, no matter which way the piece fit into the puzzle, the numbers read the same way up, orientated all the same way - presumably to help with this very kind of mistake. It takes quite a while to take apart those long seams across the 60" quilt, especially as I had shortened my stitch length considerably. But I pressed on that very night, knowing that if I set the ripping out aside the project might sit for months. I laid it out and checked it thrice and then sewed it all back together correctly. Then the paper had to go. Although I stitch with a short stitch length, I always worry that taking out the paper will pull out the stitches or distort the piecing by stretching it on the bias. So I watched some netflix and with the help of my tweezers, I took out each piece of paper. Again the internet was helpful. Some folks wet the paper - but I had taken this pattern to the copy shop to print out the pieces and was worried that the ink might run or worse that I would end up with gummy globs in the stitching, especially at the points so I stuck to the slowly taking out the dry paper. Again, I finished this part in two nights, as I knew if I put is off the whole quilt would sit and sit. That is not actually a photo without the paper as I have to press the quilt top now. I am going to add some borders to make it bigger than a 60" square - maybe I will push it up to 80 or 90". This quilt is for my youngest son for his University dorm room and it is best if it can cover the bed and have some to spare over the edges. Stay tuned for more updates, I need to make a back and get it quilted too. Some reminders. 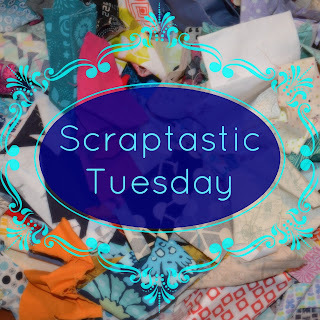 Don't forget to join Nicky and I for the March Scraptastic Tuesday link up. There are fantastic projects and inspiration in the links and great prizes too. Go here to link up and do that by Monday night. And if you have not yet entered the SCQ Blog Birthday giveaway sponsored by Sew Sisters Quilt Shop, go here to my Monday post to do that. 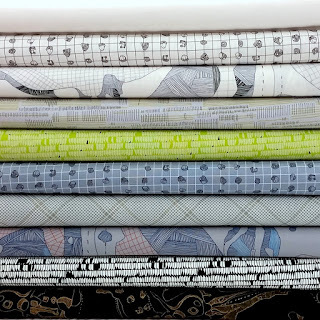 I have a 10 fat quarter bundle from Sew Sisters of those beautiful Carkai fabrics to give away, so please enter before the giveway closes on Friday night at midnight MST. This is a project on my 'list' - I so love this pattern. 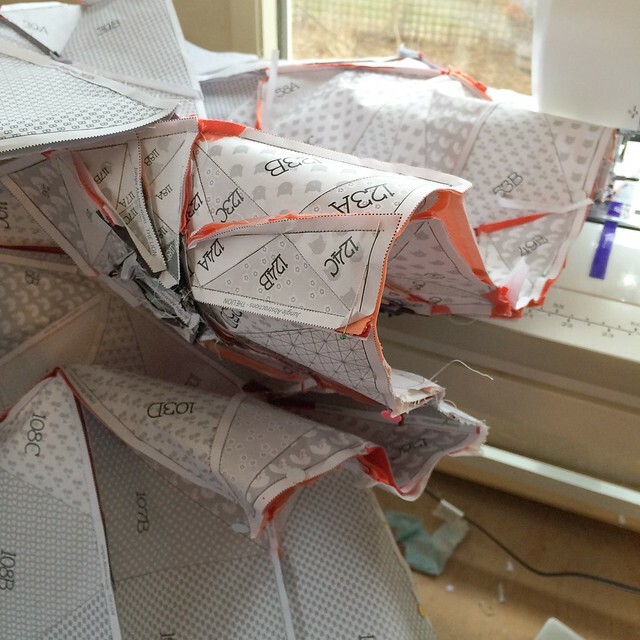 I like to remove papers and then sew the units together, but that is me (and some scold me it is the wrong way). Now to see you quilt this. It's stunning - you must be thrilled with it! Oh-my-goodness!!! This is such an absolute stunner! Wow, you did an amazing job, well done! So looking forward to seeing how you quilt it. A mistake? The only way I caught it was to quickly scroll up the page. For some reason I spotted it. Hard to find, and a good conversation to have around the quilt in person, right? :) I am so impressed you ripped the seams and fixed it that night. This piece is just stunning. 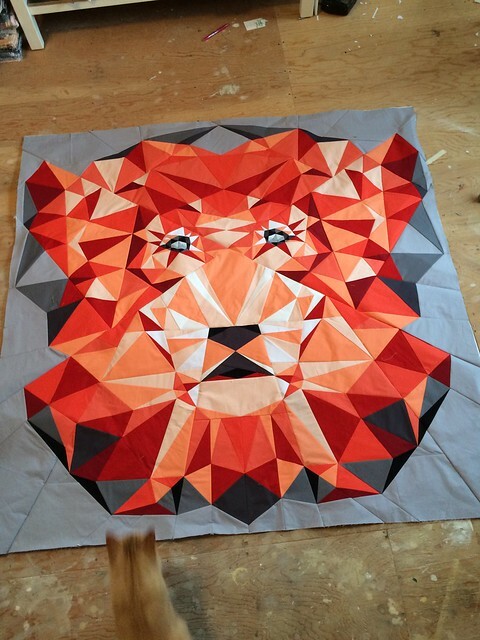 I have not had the nerve to tackle one of Violet's larger patterns, but the lion is making me rethink that. I love that you left the mistake in (not that I could find it). It makes me think of the artisans who deliberately place a minute mistake in their work. Something along the lines nothing is perfect. It is absolutely fabulous - well worth all that work. I'm impressed - taking out all that paper must have been tiresome. The end result fabulous, definitely worth the effort. wow! Fantastic - really wonderful and impressive. Great job! holy crap. what a project. I hope your son appreciates this. 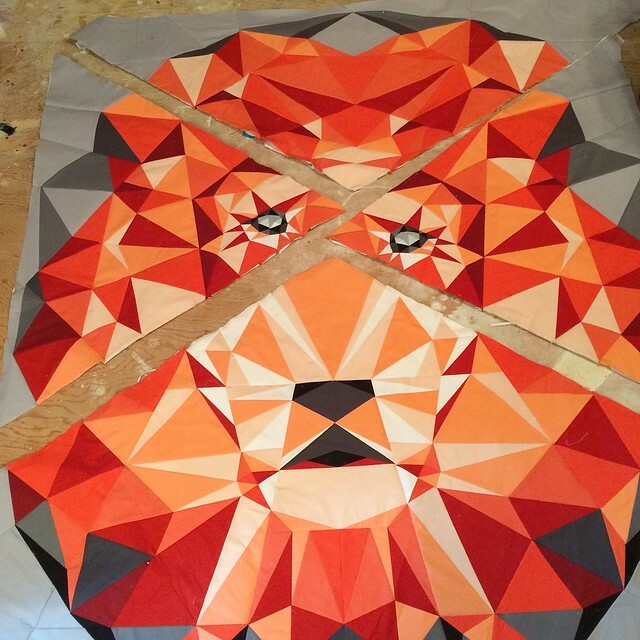 the Lion looks happier with his eyes fixed! Awesome job and your press on attitude is equally impressive. Great works often come when we buckle down and stay the course. Congratulations. Your lion is truly magnificent - lucky son! And I love your self awareness - knowing when you need to press on to avoid losing momentum. Really amazing. But isn't ripping out those teensy paper-piecing stitches the absolute worst? Wow - that is a project and a half! Such great progress this week!! WOW ... just WOW! That lion is Stunning! I could not tell what the mistake was until you pointed it out. 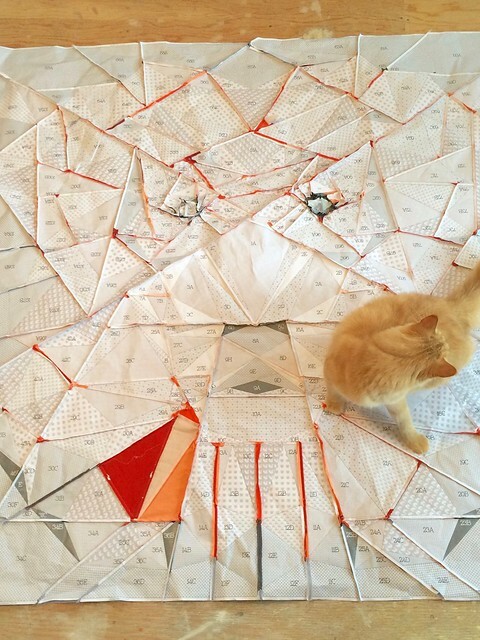 Glad you have found your quilting mojo. Mine is still missing but I'll keep looking for it. Your lion is stunning. Your son's friends will be rather jealous. Amazing! Beautiful! Kudos for toughing it out for eight months to finish it. Well worth the time spent. OMG!!! Leanne that is SO beautiful!!! I'm so jealous :*). I've bought the pattern but no fabric or time to work on mine yet. You've done an amazing job on it - you go girl!!!!! Stunning!!! You should be proud of you fortitude to stick it out!!! I see a project in my future. My granddaughter, who is a Marine, has a lion head tattoed on her back - I think she would love this. Absolutely wonderful. Top marks for persevering! For future reference, love taking ou the papers ! Oh, beautiful!!! I love it and your son sure will as well!!! So beautiful! I love your colour choices. That lion is crazy! Such beautiful work. Your son will be psyched when he gets that! I'm really impressed. It is just gorgeous. 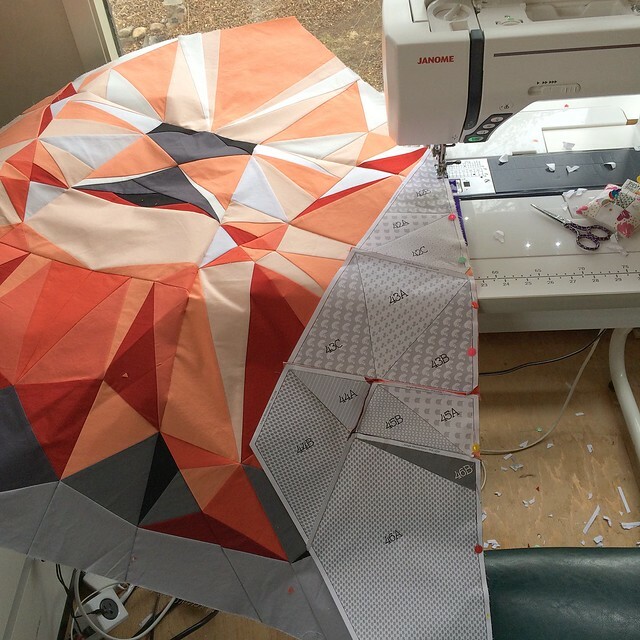 There is no way I'd ever make one but I love to see others tacking these intense projects.